Develop your skating stride, practice your shot, strengthen your stickhandling skills, build your core muscles, and improve your agility, balance and coordination — all with one flat, 1.5 m x 2.4 m, easy-to-lay-down-and-start-working mat. It’s the newly designed G1 Extreme Slide Board by HockeyShot.com! 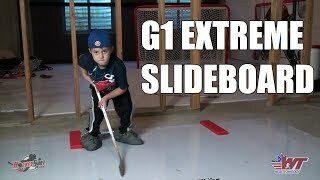 No trainer builds muscle memory in the legs like the G1 Extreme Slide Board, available at hockeyshot.com. Its rotating discs and long bumpers provide front-to-back and side-to-side push-off, and the booties it comes with let you glide and stride with ease. 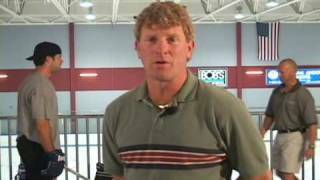 For players of all levels who need to strengthen their skating skills, this is a must-have! At 1.5 m x 2.4 m, it's big enough for full strides & to have two young players train simultaneously. You can use it for more than skating drills - it's perfect for stickhandling and passing work. Comes with 2 rotating blocks and 2 stoppers that can be used as push-offs. Two rotating blocks swivel to allow unrestricted change of direction. 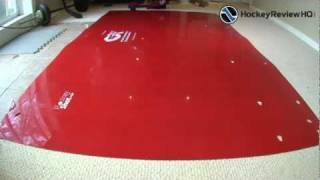 Its back-side tape adheres to almost all flat surfaces, even tight carpet. 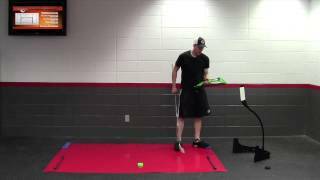 An excellent tool for young players looking to build muscle memory. Add G1 Extreme Passers to your slide board (optional). Great product. G1 extreme passers are a must. Kids love using it. Awesome slide board perfect size for working on stride and stickhandling at the same time. Needs the spray. Slides great with the spray. The only negative was that I found the original slickness of the board to be lacking. There were instructions included for improving the slickness (with Pledge) but I would have expected the board to be ready to go right out of the box. 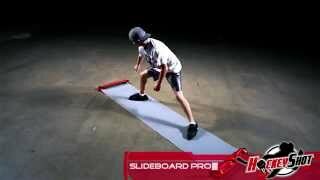 I also think that the slide board should come with a can of Ultra Slide Board Polish. Great training aid… Periodic application of furniture spray/wipes helps for the sliding, but otherwise, ready to go! Easy assembly of stoppers and additional puck passers too. Good product but does require prepping with furniture polish to make it slippery.